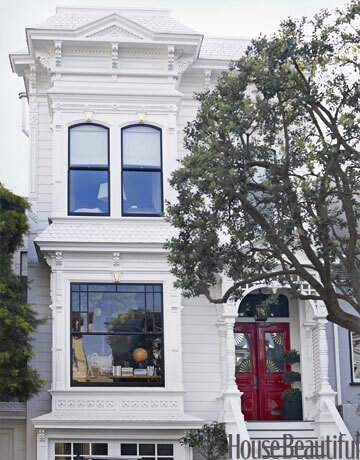 In honor of my little jaunt to the city by the bay tomorrow, I thought I'd share with ya'll a gorgeous home I recently saw over on House Beautiful. We're all big fans of big time style and glam, so get ready to crash this beautifully renovated, glamorous San Francisco Victorian. Hopefully I will get to see more stunning architecture like that over the next few days!! Thanks to everyone who gave me San Fran travel suggestions- I greatly appreciate it. And I promise a full report back with all the details of the city and the blogger meet up. I'll try and post lots of pics (along with my normal crazy antics) along the way! ooh yes! the dark moody walls in that second image are awesome! I heart that wallpaper in the dining room. Well I really heart the whole house! Have the grandest time this weekend! Love, love, love that house!!! Definitely inspiring!! Those dark walls remind me of your dining room, which look amazing! I love the front room with the gallery wall and leather chair...I'll have to keep that in mind when doing my husband's office...one day! Oh my. That staircase made my heart skip a beat. Love the staircase and the black and white...really beautiful and striking! So many nice things in this house. Have a wonderful trip to San Fran! Wow, I have so many things to say about this house...haha. All of it is gorgeous. But...that chandelier in the bathroom and the outdoor space are my favorite! So lovely. Have so much fun on your trip! 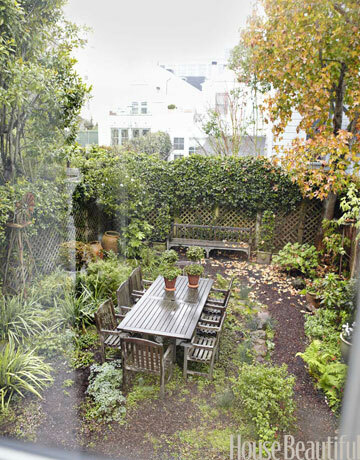 The Tanner's house would definitely be #1 on my to do list if I was visiting San Fran! I love this house!!! I saw it in one of House Beautiful's recent issues and I ripped every single picture out and stuck them in my "inspiration binder". It's so gorgeous! Such a pretty house....ooo and San Fran is right around the corner!! Yay!! Wow, what's not to love about this house! Love the chandelier in the bathroom. Have a fun trip. Can't wait to hear all about it. So beautiful! I would just die for that dining room! Love that staircase! Have a great trip Michelle! One of my favorites from that HB issue! Love the fig tree on the console by the front window :) Safe travels to San Fran!! that chandeleir in the bathroom is crazy amazing! I spy a navy wall that looks familiar!!! Two days and counting . . . oh, yeah baby!!! :) Oh, and love your painted vanity in the bathroom. Great call. Safe travels. See you in a bit! gotta love the staircase carpet with the staggered frames. I love deocrative creativity. I always get so inspired when I stop by your blog! Love. it. all x 1 million :) That kitchen is dreamy! Bon voyage...such a great house tour...all the black accents seem sophisticated. oh yes!! I read and re-read that article in HB- I think I may or may not have drooled a little on the pages too! 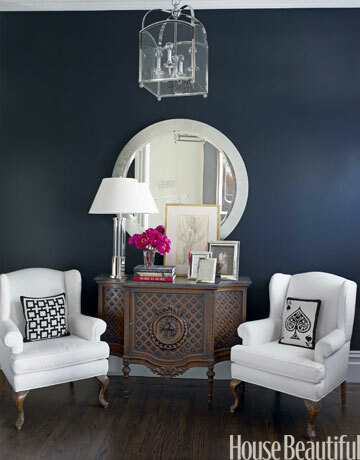 Such a chic and glamourous space-yet very comfortable & approachable. 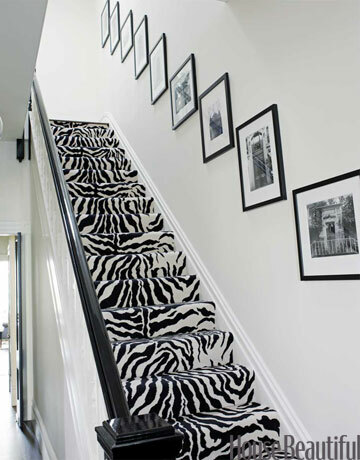 Zebra stairs! I don't think I could convince my husband that they would look good... have fun in SF! Oh yeah, this one is in my stunning files. 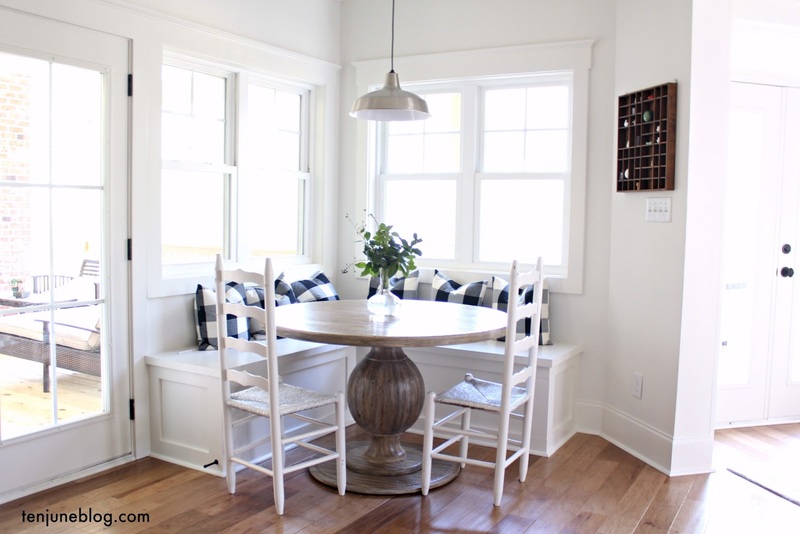 I love that little sitting area - not to mention the curb appeal! I want to walk right in!